Course credit hours and corresponding clock hours are shown in parentheses. One class clock hour/week equals one credit hour; three laboratory or practice clock hours/week equal one credit hour. NURS 3305 Nutrition and Health. An introduction to nutrition concepts and current dietary trends, focusing on health promotion. Nutrients are explored with regard to sources, dietary requirements, and health implications. NURS 3310 A Focus on Aging. This course provides an introduction to the care of older adults while focusing on their unique physiological and psychosocial needs. Emphasis is placed on promoting healthy aging and retaining functional ability within a home or residential environment. Common health alterations of the older adult as well as safety and end-of-life care are introduced. Prerequisite: Admission to BSN program. This course provides the framework for preparing students to perform comprehensive health assessments on patients. Emphasis is placed on taking a thorough nursing history, performing physiological, psychological, sociological, cultural, and spiritual assessments, as well as identification of stressors and health risks. Laboratory experiences provide an opportunity to practice assessment skills. NURS 3312 Foundations of Nursing Practice. This course provides an introduction to the professional roles of the nurse in micro- and macrosystems, as well as profession-related and patient care concepts. The nursing process provides a decision-making framework to assist students in developing effective clinical judgment skills. Emphasis is placed on the knowledge and skills needed to provide safe, quality care while developing in the role of a professional nurse. The student is given an opportunity to demonstrate these skills in a clinical laboratory setting. NURS 3330 Nursing Care of Childbearing and Childrearing Families. This course provides an integrative, family-centered approach to the care of mothers, newborns, and children. Emphasis is placed on normal and high risk pregnancies, normal growth and development, family dynamics, common pediatric disorders and the promotion of healthy behaviors in patients. Clinical experiences provide the student an opportunity to apply theoretical concepts and implement safe patient care to mothers, newborns, and children in selected settings. NURS 3331 Pharmacology in Nursing. This course provides an introduction to the principles of pharmacology, including: pharmacokinetics, pharmacodynamics, medication interactions and potential adverse medication reactions. Emphasis is placed on drug classifications and nursing care related to the safe administration of medication to patients across the life span. NURS 3350 Medical Surgical Nursing I. This course focuses on the care of adult patients with health alterations that require medical and/or surgical intervention. Emphasis is placed on the care of patients with alterations in selected body functions. Concepts of patient centered care, cultural sensitivity, informatics, safe practice, and professionalism are integrated throughout the course. 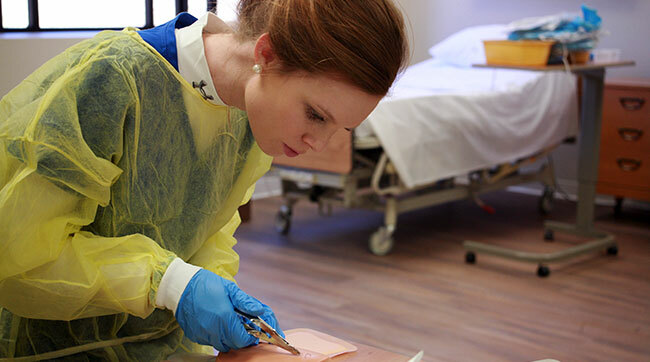 Clinical experiences provide the student an opportunity to apply theoretical concepts and implement safe patient care to adults in a variety of settings. NURS 3400 Mental Behavioral Health Nursing. This course focuses on the care of patients across the lifespan experiencing cognitive, mental and behavioral disorders. Emphasis is placed on management of patients facing physical, sociocultural, intellectual, spiritual, and emotional and psychological stressors as well as promoting and maintaining the mental health of individuals and families. Concepts of crisis intervention, therapeutic communication, anger management, and coping skills are integrated throughout the course. The community as a site for care and support services is addressed. Clinical experiences provide the student an opportunity to apply theoretical concepts and implement safe patient care to patients in selected mental health settings. NURS 4430 Medical Surgical Nursing II. This course focuses on the care of adult patients with complex medical/surgical health problems. Emphasis is placed on helping patients and their families cope with alterations in body functions. Concepts of pharmacology, health promotion and education, evidence based practice, and interdisciplinary collaboration will be integrated throughout the course. Clinical experiences provide the student an opportunity to apply theoretical concepts and implement safe care to patients and selected groups in a variety of settings. NURS 4431 Research in Nursing. This course is designed to assist students in developing a sense of inquiry as well as an increased understanding of research strategies. The course will introduce students to the research process with exploration of research designs, sampling strategies, and data analysis methods. Evaluation of research findings and use of nursing research as the basis for evidence-based practice will be emphasized. NURS 4432 Senior Capstone/NCLEX Synthesis. A seminar to assist students in synthesizing learning related to the roles and practices of professional nurses, exploring the health care system and the legal-ethical, sociopolitical, cultural, and professional issues influencing contemporary nursing. A research project is completed and presented from a proposal developed in NURS 4431. NURS 4433 Medical Surgical Nursing III. This course focuses on advanced concepts of nursing care as they relate to patients across the lifespan with complex, multisystem alterations in health. Emphasis is placed on implementing time management and organizational skills while managing the care of patients with multiple needs and collaborating with the interdisciplinary team. Complex clinical skills, as well as priority setting, clinical judgment, and tenets of legal and ethical practice, are integrated throughout the course. NURS 4440 Nursing Care: A Community Focus. This course is intended to introduce students to nursing care of individuals, families, aggregates, communities, and populations. Principles and practices of community health are discussed. Emphasis is placed on assessing factors that influence the health of populations and the use of evidence-based practices in the delivery of spiritually and culturally appropriate health promotion and disease prevention interventions. The role of the nurse as advocate for social justice is explored. professional behaviors, communication skills, collaboration with healthcare team members and ability to use conflict mediation skills and ethical comportment. NURS 4495 Independent Study in Nursing. For students meeting requirements, the opportunity to pursue special interests beyond those in the formal course of study. Prerequisite: Completion of 2/3 nursing major courses, 3.0 GPA, and permission. NURS 3411 Health Assessment for RNs. This course provides the practicing nurse with theory and skills needed to successfully conduct a comprehensive health history and cephalocaudal assessment on persons throughout the lifespan, with emphasis on building knowledge and skill in data acquisition. NURS 3413 Transition to Professional Nursing. NURS 3440 Theories and Policy Perspective. A course designed to enhance knowledge of the relationship between health care policy and professional nursing. This course will explore the broader context of health care including how patient care services are organized and financed, and how reimbursement is structured. Regulatory agencies define boundaries of nursing practice and students need to understand the scope and role of these agencies. There will be discussion how health care issues are identified, how health care policy is both developed and changed, and how that process can be influenced through the efforts of nurses, other health care professionals, and lay and special advocacy groups. Students are introduced to nursing theorists and their theories of nursing with an emphasis on developing an understanding of how it is used in evidence-based practice. NURS 3432 Evidenced Based Practice/Research. INTM 4305 Complementary and Alternative Medicine and Therapy. This course explores complementary and alternative therapies that are a group of health care systems, practices, and products that are not commonly considered part of conventional medicine. These may be used in conjunction with or in place of conventional medicine practices. Some therapies that will be examined are aromatherapy, herbs, massage, joint manipulation, Reiki, reflexology, Rolfing, special diets, meditation, acupuncture, biofeedback, and bioelectromagnetics. A course directed toward the nursing care of aggregate systems within a community. Topics include community health nursing roles and basic concepts of community health. Addresses the implementation of population-focused care through the nursing process, collaboration, and interdisciplinary skills. Includes the importance of health promotion, along with disease and injury prevention, throughout the lifespan and the assistance of individuals, families, groups, communities, and populations to prepare for and minimize consequences of emergencies, including mass casualty disasters, infectious and communicable disease, and bioterrorism. The course includes a practicum where the student integrates concepts from theory within a health care environment. Theory and practicum are designed to build on the student’s professional experience and to prepare them for population-focused practice in community public health settings where they can meet the health needs of the community. The practicum is overseen by the instructor and developed and designed in collaboration with the student. NURS 4460 Leadership in Nursing. Focuses on nursing leadership including developing and refining knowledge, skills, and attitudes in working within organizational and community arenas. Also focuses on the actual provision of care and/or supervising care provided by other licensed and non-licensed assistive personnel. Examines nursing leadership and management through use of a systems approach with a focus on quality and safety of client care. Discusses leadership models, behavior, and strategic planning at various organizational levels. Focus is on use of outcome data to evaluate nursing care delivery systems and propose quality improvement initiatives, consider enduring practice issues, social justice/diversity issues, as well as, address personal/professional development. Leadership and management roles assumed in clinical practice and increasing autonomy in patient care are guided through preceptorial experiences. NURS 4461 Capstone: Global Health Care Issues, Trends, and Informatics.